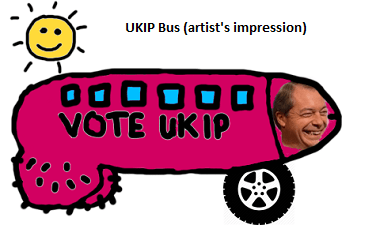 UKIP have defended their decision to launch an election campaign using a bus shaped like a giant male organ. The bus, a 45-foot long purple monster complete with helmet and sagging scrotal sack, was launched at a rally in Clacton, and attracted even greater than usual derision on social media. Elsie Renfrew, 42, almost fainted at the sight of the bus looming down on her in the high street.